Determined efforts are being made to explore the non-photosynthetic plastid organelle of Plasmodium falciparum as a target for drug development. Certain antibiotics that block organellar protein synthesis are already in clinical use as antimalarials. However, all the indications are that these should be used only in combination with conventional antimalarials. 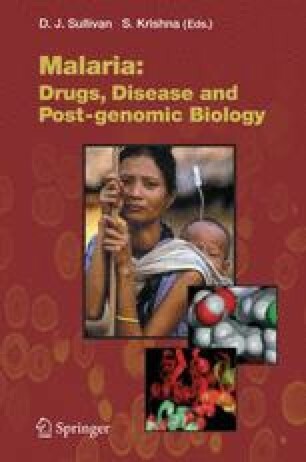 The use of antibiotics such as doxycycline and clindamycin may reduce the development of drug resistant parasites and such means to avoid drug resistance should be explored hand-in-hand with drug development. Genomic information predicts that fatty acid type II (FAS II) and isoprenoid biosynthetic pathways are localized to the plastid. However, clinical trials with fosmidomycin (a specific inhibitor of DOXP reductase in the non-mevalonate pathway for isoprenoids) suggest it too should only be used in drug combinations. Prospects for more potent antimalarial compounds have emerged from studies of several of the enzymes involved in the FAS II pathway. Lead antibiotics such as thiolactomycin (an inhibitor of β-ketoacyl- ACP synthase) and triclosan (a specific inhibitor of enoyl-ACP reductase) have led to structurally similar, active compounds that rapidly kill ring- and trophozoite-stage parasites. The FAS II pathway is of particular interest to the pharma-industry.